This is your day and we know how to enhance your experience. From practice sessions for hair and make-up to organizing the sessions and appointments for your bridal party, the staff at Gayle’s Salon and Spa is committed to helping make your special day as perfect as possible. Our fashionable modern salon and spa is the perfect place. Host a bachelorette party at Gayle’s Salon and Spa for the bride and her friends. 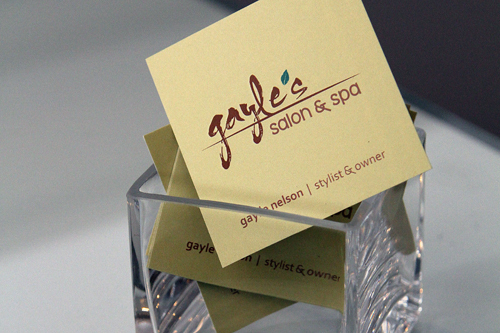 Gayle’s Salon & Spa will plan decadent spa treatments and services. You can even book the entire salon! Create a Custom Spa Party that matches your bride’s personality. Bridal party agreement – Please fill out this agreement form and return to the bridal contact. Bridal form and pricing – To help your wedding day run smoothly, and your time at Gayle’s Salon & Spa relaxing and enjoyable, please have each of your attendants fill out a copy of this form. Photography model release – Please fill out this agreement form and return to the bridal contact. Bridal consultation – Fill this out and bring it with you to your Gayle’s Salon and Spa in-salon consultation. Which bride are you? – It’s amazing how spot-on this is. Read through and decide which bride you are. Your “bridal personality” will help your stylist guide you to the perfect wedding day look. Helpful hints and suggestions – Just what it sounds like, Tips to make your time at the salon run perfectly; what to wear, what to bring, etc.